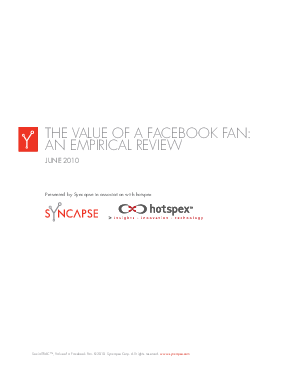 White Paper Published By: Syncapse Corp.
As Facebook matures as a viable marketing and customer service channel, many organizations are looking to quantify and understand the impact of their overall marketing investment on their business. Quantifying the Return on investment (ROI) of Facebook marketing efforts includes multiple variables and companies often fail to understand and to properly value their efforts in terms of the potential long-term business benefits of the Facebook channel. Syncapse has adopted a unique approach to understanding the financial returns that social members on Facebook provide to a business. Facebook fan ROI can be understood though a knowledge of key performance indicators that have traditionally led to increased sales and profit in business and the key differences between Facebook users who have opted to "fan" a brand and those who have not.